A cubic Bézier curve is defined by four points: P_0, P_1, P_2 and P_3. P_0 Q_0 / P_0 P_1 = P_1 Q_1 / P_1 P_2 = P_2 Q_2 / P_2 P_3 = t (t in [0,1]). Q_0 R_0 / Q_0 Q_1 = Q_1 R_1 / Q_1 Q_2 = t for the same value of t.
On the segment R_0 R_1 the point B is drawn such that R_0 B / R_0 R_1 = t for the same value of t.
The Bézier curve defined by the points P_0, P_1, P_2 and P_3 is the locus of B as Q_0 takes all possible positions on the segment P_0 P_1. to see what the Bezier curve (green curve) defined by those points looks like. You can also drag the point Q_0 along the segment P_0 P_1. 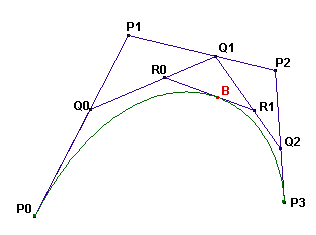 From the construction it is clear that the Bézier curve will be tangent to the segments P_0 P_1 in P_0 and P_2 P_3 in P_3. A cubic Bézier curve with P_0=(1,0), P_1=(1,v), P_2=(v,1) and P_3=(0,1) is used to approximate a quarter circle. The value v > 0 is chosen such that the area enclosed by the lines O P_0, O P_3 and the curve is equal to pi/4 (the area of the quarter circle). By how many percent does the length of the curve differ from the length of the quarter circle? Give your answer rounded to 10 digits behind the decimal point. I implemented a generic bezier() function which returns a 2D point interpolated between four Bézier points. It relies on the deCasteljau algorithm (see en.wikipedia.org/wiki/De_Casteljau's_algorithm). A bit more accurate and much faster is bezierArc which assumes that the four Bézier points are (1, 0), (1, v), (v, 1), (0, 1). v is unknown and 0 <= t <= 1. After a sufficient number of iterations v should converge to the correct value. But no matter what I tried, I got pretty close but couldn't solve this problem. I couldn't find a better result than a 0.000000122206% deviation from the quarter circle which is wrong. (if you optimize the constants StepT and AreaAccuracy you might find slightly better value but most likely not the correct one). I tried to continue with Wolfram Alpha but lost interest when I saw the weird integrals generated by it. As mentioned before, Wolfram Alpha will find the correct result. That approach is surprisingly fast - the main obstacle was to find a proper epsilon (I settled with 10^-17). Meng-Gen Tsai solved the whole problem with Wolfram Alpha despite all the ugly integrals. I could have integrated equations (7) and (8) numerically (instead of writing getLength()). There is no live test. My personal view on this problem: I have a background in Computer Graphics and really like Bézier curves. After having solved this weird problem, I'm not sure whether I still like Bézier curves anymore. This problem changed a conceptually very simple technique (especially the very elegant de Casteljau's algorithm) into something full of meaningless integrals. It took all the beauty out of it. That's sad ! // change direction ? reduce "step"
This solution contains 26 empty lines, 38 comments and 5 preprocessor commands.